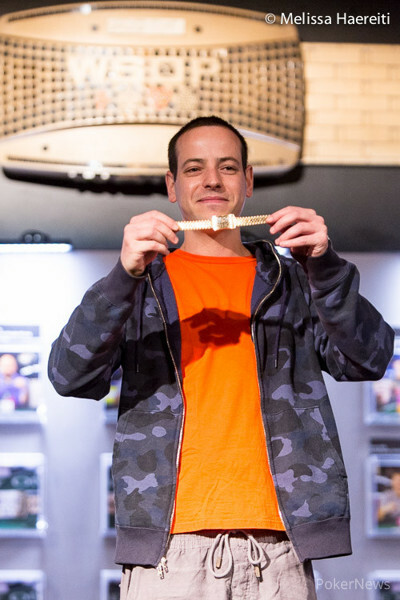 Eric Buchman nabbed his second World Series of Poker bracelet today, winning a short final table of Event #34: $1,500 Seven-Card Stud for $118,785. Few could question Buchman's limit poker prowess, as he has a bracelet in limit hold'em along with a second-place finish in eight-game, a second-place finish in limit hold'em, and a third-place finish in stud at the WSOP. 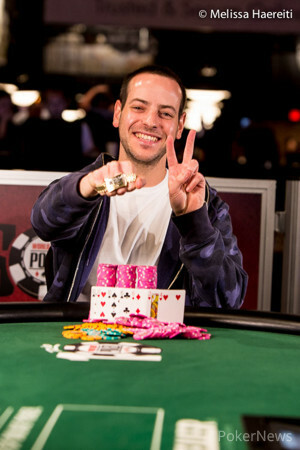 Buchman may be best known for a deep run in the 2009 Main Event, which resulted in a fourth-place score for over $2.5 million. Coincidentally, Buchman made it two 2009 November Niners to take down bracelets in two days after 2009 winner Joe Cada scored a second bracelet last night. New York native Buchman topped a field of 345 to take down the title, but only six came back for Day 3 today. That didn't mean the path was easy, as tough pros Bryn Kenney and Alex Kravchenko were among the players returning. Kenney bowed out in fifth early on, and Buchman took about a two-to-one chip lead into heads-up play against Kravchenko after Day 3 chip leader Aleksandr Denisov busted in third. The two battled for about an hour, with Buchman ultimately finishing off Kravchenko after taking most of his chips with a ten-high straight. Thanks for tuning in to another great WSOP event here on PokerNews, but since this one's done so early, there's still a smorgasbord of poker coverage from which to choose. Alex Kravchenko completed with , and Eric Buchman called with . Buchman raised when he picked up , only to see Kravchenko raise it right back with the . Kravchenko then bet fifth and sixth, but Buchman fired a raise then. Kravchenko called. Buchman bet the river, and Kravchenko called. Buchman showed for a straight to the ten, crippling Kravchenko down to 34,000. A couple of hands later, Kravchenko was all in on fourth. Buchman had tens, while Kravchenko had sevens and a three-straight. Fifth street for Buchman was the , giving him trips, while Kravchenko also caught good with the for a straight draw. Buchman received the to fill up on sixth though, ending the tournament. Both players checked the river, and Buchman showed for jacks and nines. Kravchenko revealed a before mucking. Eric Buchman completed with , and Alex Kravchenko called with . Buchman kept the lead on fourth, but ceded it on fifth. Buchman bet sixth when he paired with , but Kravchenko raised with the . 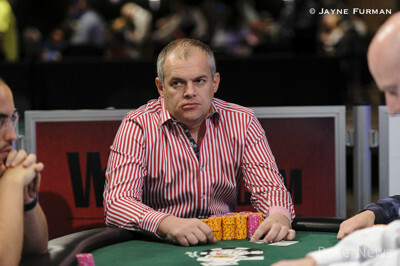 Buchman folded to a river bet. Eric Buchman completed with and called a raise from Alex Kravchenko, who had the . Kravchenko proceeded to bet every street until the river. After the last card, Kravchenko check-called. Buchman showed him for tens up. Eric Buchman completed with , and Alex Kravchenko called with . Kravchenko check-called after getting the high board with while Buchman had a , Kravchenko again bet-raised fifth and got called. Buchman paired on sixth and bet, getting another call before Kravchenko folded the river. A few railbirds from the sparse crowd clapped as Buchman dragged the pot. Eric Buchman completed with , and Alex Kravchenko called with . Kravchenko bet fourth when he picked up a against a , and three bets went in on fifth with Kravchenko bet-raising. Both players checked sixth street as Buchman got the and Kravchenko the , and Buchman bet seventh. Kravchenko called, losing to for two pair. Alex Kravchenko completed with the , and Aleksandr Denisov raised with . Eric Buchman woke up with a reraise from the bring-in - showing the - and Kravchenko got out of the way. 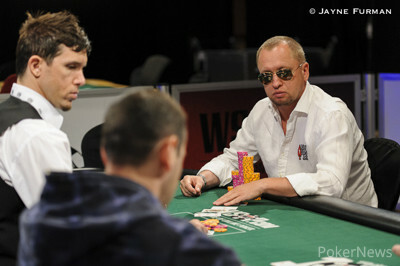 Denisov called bets until a raise on fifth street put him all in. Buchman picked up a set and Denisov was in bad shape with aces up. Both players got dealt a on sixth street. The river for Denisov signaled the end for the chip leader coming into today.